Three weeks ago Nancy and I visited Antarctica. It's not easy to get there. It is completely inaccessible in winter, and even in summer it is quite a shlep. We had tried once before, years ago, to fly there, but bad weather kept us on the ground in Punta Arenas, Chile. This time we took a boat from Ushuaia, Argentina, which is more reliable, but takes a lot longer. Just getting to Ushuaia was quite an odyssey. Our road to Argentina went by way of Los Angeles, Lima, and Santiago, where we spent a day before continuing to Ushuaia. Santiago is a nice city (vastly nicer than Lima), but having to disembark in Chile was annoying because the country has a admission charge of $160 for U.S. citizens. It's called a "reciprocity fee" but to me it seemed indistinguishable from institutionalized bribery. Worse, to pay the bribe, er, fee, you had to wait in an interminably long line. Then, after paying, you then had to go wait in another interminably long line to actually clear immigration. All this while dealing with five time zones and twelve flight hours worth of jet lag. I kept having to remind myself that this was a nice problem to have. We finally got out of the airport and were met by a representative of our tour company, ushered on to a bus to our hotel and got checked in amidst the usual chaos that ensues when a busload of people all show up at the front desk at the same time. In the confusion, the local rep neglected to give us the little package of mostly useless "Welcome to Chile" documents. How do I know that the documents that we didn't get were mostly useless? It's because somehow at 4:30 AM local time the following morning -- after we had spent the day on a pleasant but uneventful tour of the city -- the hotel concierge suddenly realized that we had not received our package, and took it on themselves to call us right then and there to tell us that there was some "important information" waiting for us at the front desk, and that we should come down right away. So I groggily put on some clothes and went down to the lobby where I was handed this very elegantly produced bundle of ads for local merchants, together with the schedule for the previous day. I was not amused. We headed out the Beagle Channel towards the Falkland Islands en route to South Georgia island and thence to the Antarctic peninsula. The waters we were crossing are notoriously rough. Down in that part of the world there is very little land to stop the wind, and so it can whip up something fierce. Particularly to be feared were the last two days of the cruise, where we had to cross the dreaded Drake passage to get back to Ushuaia. But I'm getting ahead of myself. Happily for us, the one-day crossing to the Falklands was uneventful, and we landed in Port Stanley on what passes for a fine summer day down there. 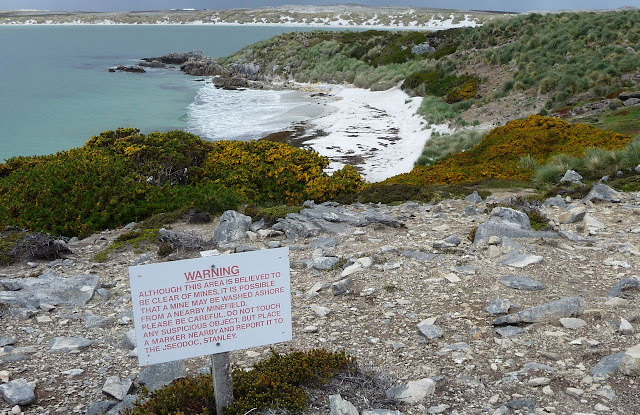 In case you can't read it, the sign says, "WARNING - Although this area is believed to be clear of mines, it is possible that a mine may be washed ashore from a nearby minefield. Please be careful. Do not touch any suspicious object, but place a marker nearby and report it to the JSEODOC, Stanley." Those mines, of course, are left over from the 1982 war with Argentina. Now those old tensions are flaring up again. Argentina seems to be rattling its sabers once again, and we were told that we were the last ship out of Ushuaia that was going to be allowed to dock at Port Stanley for the rest of the season. It was sobering. We dodged a bullet figuratively. But the Falkland Islanders may be doing it literally before long. Thanks! I'll be writing more travelogue installments soon.